Huge apartment (2 bedrooms) in good location. We recived help with order a taxi to railway station. Amazing apartment, lot of space, everything clean, perfect location. If I come back to Astana, I´ll use this apartment definitely again. It's a huge appartment on the 23th floor of a very nice building. The view was amazing. There were two bathrooms, the appartment is well equiped. The location is perfect. Great and fast check in. The host did a good service. Very big house. Two bathrooms. The property manager came over personally to give us the keys and opened the doors for us. Washing machine very useful. Hairdryer and drinking water also supplied. They allowed us to check out late. We communicate with the owner via email and reply was ok fast. The property manager cannot speak English but we were able to communicate via google translate. A supermarket inside the building is very convenient. Astana on the whole is not a walkable city - it's too big like Dubai, so we need to call Uber every time we went out. Удобное расположение. Чисто, комфортно, много места в квартире. Белое постельное белье, два санузла, две спальни с широкими кроватями. Уезжали в 5:00, Сергей приехал даже в такое время, совершенно бесплатно. Спасибо за приятное времяпрепровождения. Lock in a great price for Apartment Astana Triumph – rated 9.4 by recent guests! One of our best sellers in Astana! Located within 2 miles of Bayterek Monument in Astana, Apartment Astana Triumph provides accommodations with a flat-screen TV. Free WiFi is available. Each unit is fitted with air conditioning, a private bathroom and a kitchen. An oven, a microwave and fridge are also offered, as well as an electric tea pot. Expo 2017 Astana is 5 miles from the apartment, while Mega Astana Shopping Centre is a 13-minute walk from the property. The nearest airport is Astana Airport, 14 miles from the property. 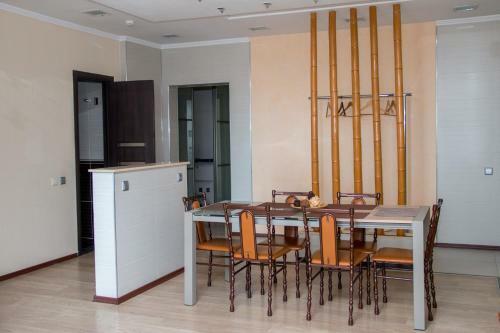 This property also has one of the top-rated locations in Astana! Guests are happier about it compared to other properties in the area. This property is also rated for the best value in Astana! Guests are getting more for their money when compared to other properties in this city. 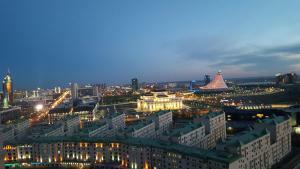 When would you like to stay at Apartment Astana Triumph? This apartment features air conditioning, soundproofing and stovetop. This apartment has a kitchenware, washing machine and soundproofing. House Rules Apartment Astana Triumph takes special requests – add in the next step! Free! Any additional adults stay free of charge for extra beds. Apartment Astana Triumph accepts these cards and reserves the right to temporarily hold an amount prior to arrival. We liked everything. I think this must be one of the top places to stay in Astana. Apartment was dirty with a lot of dust. It was tough to find right entrance in the building - building is huge and there is no information at the confirmation of booking about number of the entrance. Communication with the hosts is really challenging, as nobody speaks a word of English. Everything else is more than ok. The bathroom was a little bit dirty. The air conditioner in the dining room is not working. One of the bedrooms does not have air conditioner, but it was fine without air con during our stay.